The state of healthcare was deeply damaged by the 14-year civil war that took place in Liberia from 1989-2003, and the need for pediatric care particularly dire. In a conference I attended through HEARTT (Health Education and Relief Through Teaching, a non-profit corporation founded in 2005 to address the medical workforce shortage in Liberia), I learned that there is currently one pediatrician practicing in Liberia, a country in which nearly 50% of the population is under 15 years of age. Pediatricians are lacking in a place that could not need them more: infant mortality rate and under 5 mortality rate in Liberia are among the top 5 in the world, and an estimated 15% of children under one year of age die before their first birthday. With these statistics in mind, my initial interest in working in Liberia became a goal that, with the help of the Benjamin H. Josephson, MD Fund, turned into a reality. I was fortunate enough to spend the last month of my pediatric residency working at the John F. Kennedy ("JFK") Medical Center in Monrovia, Liberia. JFK, once a leading West African medical center, is in the process of being renovated and rejuvenated after it was overrun and shut down during the war. 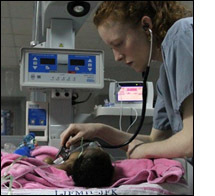 As a pediatric resident and volunteer for HEARTT, opportunities to provide medical services abound: on the inpatient pediatric floor, in the outpatient clinics, in the ER, and in the NICU. I spent the majority of my time working on the 28-bed pediatric ward where I was able to take care of patients directly. Coming from New York, I quickly went from managing patients with the obesity that is epidemic in East Harlem to treating patients with severe malnutrition. Routine admission orders went from "rule out sepsis" to "sepsis." Conditions previously only known to me through the crisp pages of a textbook came to life: measles, malaria, marasmus. My practice as a physician will be colored by the contrasts I saw during my time in Liberia, but it is also one that will be enriched by the striking similarities. The children of Liberia live a world away from those in New York City, but their needs are the same. As an active participant in patient care I was able to share the skill set fundamental to a pediatric resident in the United States, while at the same time learn how to treat and manage conditions previously foreign to me. Thank you for this invaluable opportunity - it is one I could not be more grateful for.